After 4 months of life in the unvarying darkness of night, the changes occurring around station over the past couple of weeks have been both surprising, and a bit unsettling. Driven by the dawning light, the world around us is evolving, and at a pace none of us is quite prepared to deal with after the plodding progress of winter. Don't get me wrong - lots of things happen throughout the depths of winter, just nothing changes. Nobody new turns up, there is no new food or drink, nothing new on TV or in the store, and even the weather is only variable within a few categories (windy/cloudy/clear). Each day, week, and month is virtually indistinguishable from those which precede or follow it. Now, the sky has lit up with the brilliant light of a sun not to rise for two weeks. It's a rich, warm blue twilight, well distinct from anything we've seen in months. Heading outside inevitably brings up some long dormant memory of a sunrise seen in a previous life: sometime in early January for me, last November for most people. I can't count the times I've walked out of DSL to visit the washroom (ie. the bucket in the boiler room) and caught myself thinking it must be nearly Christmas, based solely on the quality of the light outside. The sastrugi and drifts, which have been growing ever larger all winter, are now clearly visible, and the whole landscape has changed from a black emptiness into a sea of windswept textures. The stars are gone, and the moon (which rose again yesterday) sheds a light so pale and cold that even it - our erstwhile surrogate sun - is easily missed in the glow of the not-yet-risen real sun. We're scheduled to unplug the windows this weekend, when the station will suddenly revert from a sealed box into a building, more reminiscent of a home up north than the cage it has been slowly becoming. Seeing the world outside from the comfort of the galley seems like an unimaginable luxury, and being able to assess the weather without going outside to check will be a nice novelty. The changes in light outside have brought on remarkable changes in the psyche of everyone on station. People who had largely been hiding in their rooms since shortly before or after midwinter have emerged, friendly and excited. The rest of us are no less affected, with personalities well known abruptly gone, and some of the quiet folks now boisterous. The weather, while still in essence either clear or stormy, has become more extreme with the dawn. Sunlight tends to churn up the air, and we've been hitting both colder colds and warmer warms, along with some absurdly hot storm fronts. As I write this, the temps have risen into the -20s F for the first time since January. 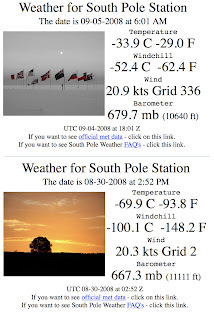 Last week, the windchill broke -100C, just barely missing -150F. I hadn't realized how much I'd settled into the steady unchanging darkness of winter. It's astonishing to me how plastic we as people are - something as basic as a sunrise can come as a shock, and the month it takes to complete can seem disarmingly rapid.